A massive influx of refugees from Libya, where ISIS extremists have been gaining ground, can be halted or at least reduced by extending “targeted ant-terrorist strikes” into the coastal area, said the Italian FM. “We don’t have months and months [to sort this out]. The double risk of the advance of the Islamic State group in Libya and the waves of migrants means we are in a race against the clock,”Italian foreign minister Paolo Gentiloni told the Corriere della Sera. Gentiloni said part of the solution could be “targeted anti-terrorist strikes” against the ISIS-controlled strongholds along the Libyan coast. “We need to take care of this emergency not as a single country, but as a union,” he said. The quest to reach the safe waters of Italy via the turbulent waters of the Mediterranean ended up in tragedy earlier this week, when Muslim travelers threw 12 Christians overboard during one of the crossings. The Italian authorities arrested 15 people believed to have been responsible. Hundreds of Libyans died making the crossing this week alone. Just last Sunday 400 migrants drowned when their vessel capsized off Libya coast. In the most recent incident, early Friday morning, the Italian Coast Guard saved 70 people off the island of Lampedusa. Traveling a long journey on a rubber dingy, the refugees had to be stretchered off to shore as they suffered severe burns in a gas cylinder explosion. As ISIS advances in Libya gain pace, an estimated 1,000 refugees have perished crossing the sea since the beginning of this year. That’s compared to just 17 during the same period of 2014, according to the UN refugee agency. “Those who do make it pose a threat to the European population,” said Giovanni Muraca, a local councilor in the port of Reggion Calabria. Claiming that the authorities are overwhelmed by the number, he said many are being treated for infectious deceases in reception centers before they are sent off. “By the end of May, Europe for the first time will have a comprehensive holistic policy on migration,” the European Union's Commissioner for Migration Dimitris Avramopoulos said Friday. Despite the dire threat posed by a flood of refugees to Europe across the Mediterranean, not everyone believes that bombing IS positions could help resolve the problem. Yet the threat to Europe remains real not only through the influx of people seeking safe haven, but also Islamic State fighters who earlier threatened to enter Europe across the Mediterranean as refugees. The plans, analyzed by British anti-terrorism think tank Quilliam in February, outline a possible strategy to illegally ferry fighters across the sea from Libya into southern Europe, into ports such as Italy’s southernmost island of Lampedusa. Amid a chaotic situation in Libya three years after the US-led NATO operation toppled Colonel Gaddafi, the Islamist Libya Dawn and Operation Dignity factions, headed by Lt Gen. Khalifa Haftar, have been battling for power in Libya, creating a separate government and army rival to internationally-recognized Abdullah al-Thani’s parliament in Tobruk. A third power gaining ground in Libya is ISIS, with at least three terrorist groups in north African country swearing allegiance to the Islamic State this year. 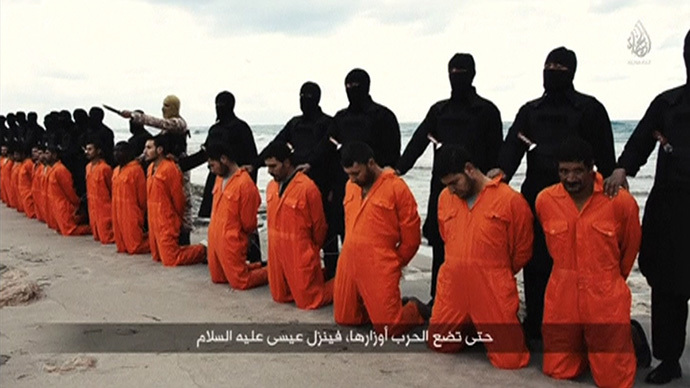 According to US estimates between 1,000 to 3,000 militants are now fighting for the Islamic State cause in Libya and carrying out atrocities, such as beheading of 21 Egyptian Coptic Christians. Since the start of the year, ISIS carried out a number of attacks and has captured the Mabruk oilfield south of Sirte.